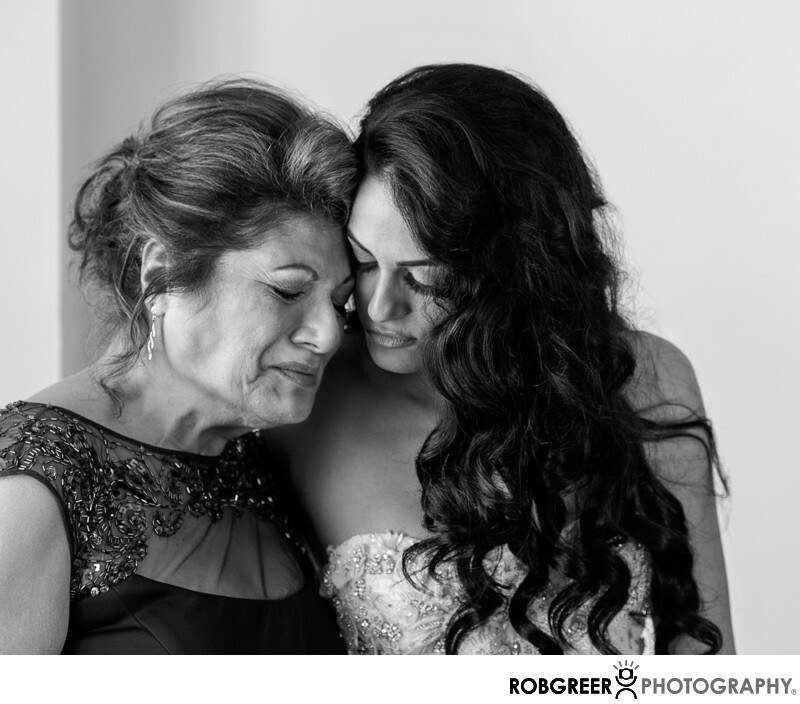 This tender moment between a bride and her mother was photographed in a suite at the Westin Pasadena. After the bride finished getting dressed, the bride's mother helped her with a piece of jewelry. Moments later, their heads were together while the mother fought back her tears. Creating natural, candid photographs like these on a wedding day is a large part of my job. Not every wedding includes an emotional moment between a client and parents, but I'm always careful to be discreet and do my best to create an environment were moments like this may come about naturally. The light in this image comes from a window to the left of the bride and her mother. As a photographer who often works at the Westin Pasadena, I often suggest different room types based upon the size of the wedding party and how many bridesmaids or groomsmen might be present in any room. This particular wedding had a large wedding party and thus I suggested a suite after the makeup artist and hairstylist finish their work, I moved the furniture in the living room area away from the window to create an open area where the bride could get dressed. As a Pasadena wedding photographer, I feel that it's important to stack the deck in my favor rather than depend on everything in the environment being perfectly situated for allowing my photographs to feature backgrounds that are less than ideal. Westin Pasadena is located in Pasadena, California. Phone: (626) 792-2727. Website: http://www.starwoodhotels.com/westin/property/overview/index.html?propertyID=1453. Location: 191 N Los Robles Ave, Pasadena, CA 91101. Keywords: Westin Pasadena (12). 1/160; f/5.6; ISO 1000; 86.0 mm.